Nuclear Methods, Volume 1: Introduction to Radioanalytical Physics provides an introduction to the physical principles of radioanalytical methods. This book discusses the nuclear reaction mechanisms, the practical formula for elemental analysis, and the interaction of charged particle beams with matter. 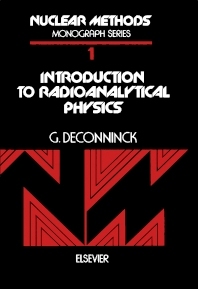 Organized into six chapters, this volume begins with an overview of the nuclear reaction principles, including reaction mechanisms, kinematics, and cross sections. This text then explains the calculation of straggling effects that play a major role in depth profile analysis. Other chapters consider the backscattering of heavy charged particles, which is a well-established method for surface analysis of heavy atoms. This book discusses as well the possible use of nuclear reactions as an analytical tool. The final chapter deals with some examples of investigations carried out in various disciplines. This book is a valuable resource for scientists of diverse scientific backgrounds such as biologists, physicists, chemists, engineers, and metallurgists.